I’m guessing you either know me and found mattsoldmanrants via Facebook. Or maybe you know me but found this place in some totally random way – a Google search or something. Or maybe you don’t know me at all but you know someone who does, so you still managed to find this place via Facebook anyway. Or maybe you do know me and found it on Google. The possibilities are endless. Well from what I can tell, it all started with a Facebook status update back in April 2010. I’ve always had fairly strong opinions about lots of random things and I’ve never had a problem expressing them. Whether anyone’s ever wanted to actually hear them is another question entirely, but as far as I was concerned it was a case of ‘the more controversial, the better’ – any topic that prompted thought, comment or intelligent debate was ripe for the picking. As time marched on and I’d been forced to accept the unavoidable truth that I was in my mid-30s I also came to recognise that, more and more with each passing day, the things that bugged me and that I found myself most frequently talking about with friends were sounding like the intolerant rants of an old man – jaded, angry, cold, loveless, pissed off with the world, anti-young person, anti-technology, anti-anything ‘new’ at all really, be it animate or inanimate. I only have the vaguest recollection of a bunch of us talking about the strength and veracity of my frequent opining on one of our then frequent after work pub sessions. 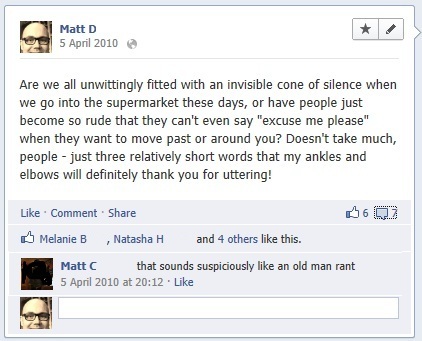 Someone – I don’t clearly recall who, but possibly my friend Matt (there are many Matts in my circle) – got us onto the concept of old man-style rants. At some point shortly after this, I published a Facebook status update that was uncannily similar to my always over-the-top alcohol-fuelled diatribes; calling me on it, Matt came back with the comment that it sounded suspiciously like an old man rant. That was 5 April 2010 and I think that could’ve been the seed sewn! So I decided to get it out, to exorcise my old man-esque demons by publishing them to the public domain – and how better to do that than with the help of Facebook? At that time the character limit of a Facebook status update was still extremely restrictive, but I’d long ago moved away from the whole Matt: is trying to think of what to do today-style of post, even though most users still seemed oblivious to the early 2009 change from “What are you doing right now?” to “What’s on your mind?”. I just knew that as long as I could sufficiently make my point within the available word count limit, all would be right with the world. The original intention – and, indeed, the reality for a time – was that the rant posts would only be occasional. Initially I positioned them as a weekly thing, so I prefaced them all with Matt’s weekly old man rant. Soon enough there were gaps of two weeks, so I started prefacing them with Matt’s bi-weekly old man rant. Sometimes there’d be a flurry of activity and I’d need to publish an out-of-cycle rant; my inner OCD freak wouldn’t allow me to change the preface of these off-cycle posts, so I simply published them sans references to old man rants. Over time, the elapsed period between rants became longer and longer and I changed the preface to numerous variations on the Matt’s occasional old man rant theme. Eventually I dropped the preface altogether, though the essence of the old man rant was always very much present. I also tried to inject my own style of ‘dry humour’ into most of them, if only to take the edge off what would otherwise have come across as little more than acidic, venomous attacks. That’s not to say they weren’t reflective of what I actually thought or how I really felt… just that sometimes it doesn’t hurt to pre-empt ruffled feathers a little. Thinking about it now, I’m not entirely sure how well (if at all) “my own style of dry humour” actually translates to the written word – some people have a very distinctive style of writing which is markedly different to how they actually speak; when I write, I try to use the same kinds of phrasing and sentence structure I’d use when speaking, so when they read what I’ve written I’m sure people who know me well enough can probably imagine me saying it. By September 2010 I’d finally upgraded to my first real ‘smartphone’, so with Facebook now at the ready anywhere, any time, the world was my old man oyster and my rant output was significantly ramped up! Positively, the rants have almost always struck a chord with people. They’ve typically generated lots of comments and discussion and, eventually, friends started telling me how much they enjoyed and looked forward to – even loved – my old man rants! So just over a week ago, the opportunity of starting my own blog presented itself in the most unexpected way. It was actually one of the sessions that formed part of our annual all-staff work shin-dig. We had a professional blogger, Nikki Parkinson, facilitating a kind of instructional session on blogging, during which we had less than 40 minutes to listen to Nikki’s introduction, set up our account, then start, finish and publish our first post, inclusive of pre-determined ‘theme’ – challenge issued and accepted! It was a fairly obvious move for me to fall back on an old man rant-type affair and, certainly, not everyone in the room was lucky enough to have such an accessible source of inspiration. When Nikki announced me as the ‘winner’ of the exercise, it was truly like coming home. I’d suspected for some time that blogging was probably something I’d enjoy, despite never having actively gone after it before. By the end of the session, though, I already knew I’d love it and was convinced I could keep it going. Within my first week as a dedicated blogger, I was pumping out one new 700-1000 word post every day and, right from the off, there was reaction to them! Not only have my posts already generated intelligent debate and comments (some more than others) but I’ve even had comments, feedback and suggestions provided to me in person! That someone would take time out of their day just to talk to me about something I’d posted to my blog was altogether unexpected. It’s also kinda humbling, in its way – people telling me how much they’re enjoying my posts, that my blog’s the first thing they read in the morning over coffee, that it keeps them occupied on their way to work in the mornings… one friend even asked if I’d ever been a journalist! So please enjoy mattsoldmanrants. If you have feedback or comments, don’t be shy to use the Reply function at the bottom of each post – Gd knows I spend enough time telling people what I think already, so it’d be nice to know what someone else thinks, for a change!